So I raced into the tree to save whatever poor feathered creature was about to have a nasty shock…. It was an awkward angle, I had to use a flash (not my strongest skill by a long way) and frankly I was quite scared whilst taking it! I’m not allergic to bees… but equally I didn’t want to find out what happens if you get stung several hundred times either. But I’ve never let personal safety get in the way of my photography, and I wasn’t going to start now! Which got me thinking… How stupid is stupid? 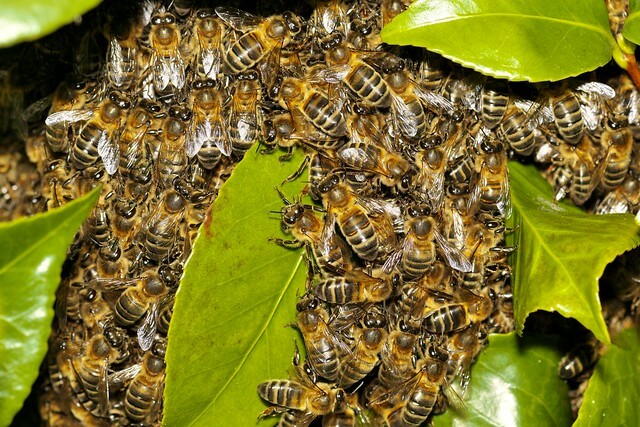 It seems a swarm of bees is pretty docile, well unless they perceive a threat… So perhaps I was rash to fret.. But my knowledge of swarming bees was obtained only after the shot..
What risks would you take to capture a shot of something you’ve never seen before? I’ve been on this planet for a fair few decades now, I’ve never seen a swarm before, and perhaps I might not again, so taking a photograph was -for me- the only safe option.